This new range of gym rubber flooring tiles, made from recycled rubber crumb granules, have been designed for use in weightlifting areas, strength and conditioning facilities, commercial gyms and fitness studios. All InstaFloor rubber gym flooring is made from recycled rubber recovered from worn vehicle tyres, preventing them from going into landfill and creating a fully recyclable product that is kind to the environment. Being manufactured from rubber crumb granules, these tiles are extremely durable and give excellent acoustic performance, reducing impact sound entering the structure, as well as preventing damage to the sub-floor. 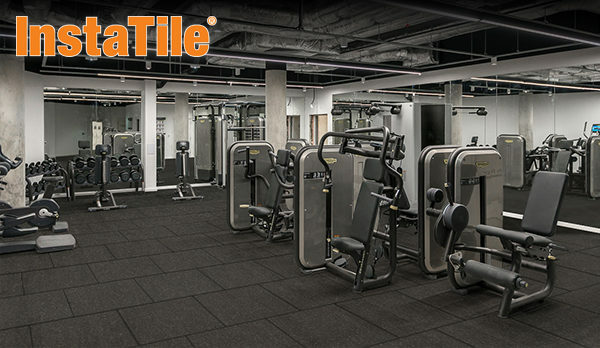 These rubber tiles help health club and gym facility owners find a solution to acoustic noise issues that are associated with the low frequencies of sound and vibration created by gym equipment. This is increasingly important as a growing number of gym and fitness facilities are now being built on upper floors within residential and commercial buildings. Consequently, preventing impact sound has become a major concern. The InstaTile standard range, designed to meet the varying demands for both shock absorption and acoustic performance, are installed by simply bonding them to the sub-floor. In addition, interlocking tiles and coloured finishes are available by special order.